Ctrl+Home. Moves to the first row in a sheet. Ctrl+End. Moves to the last row in a sheet. Alt+Home. Moves to the beginning of the project timescale (Gantt Chart, Resource Graph, usage view). Alt+End. Moves to the end of the project timescale (Gantt Chart, Resource Graph, usage view). 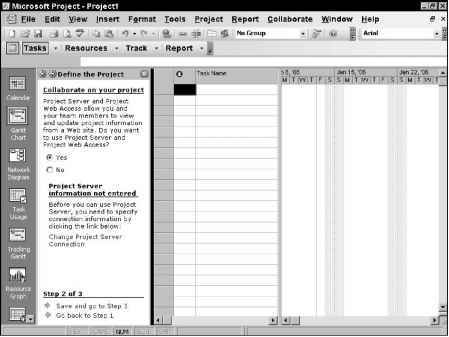 (Gantt Chart or usage view) to the location of the task or assignment selected in the sheet portion of the view. F5, "Today". Moves the chart portion of a timescaled view (Gantt Chart, usage view, or Resource Graph) to the location of today's date. You can either click today's date in the Date box, or type the word "Today" in the box.